Check out this article on The Travelin’ McCourys! The complete DelFest lineup and schedule have been announced! The Travelin' McCourys Won a Grammy Award! 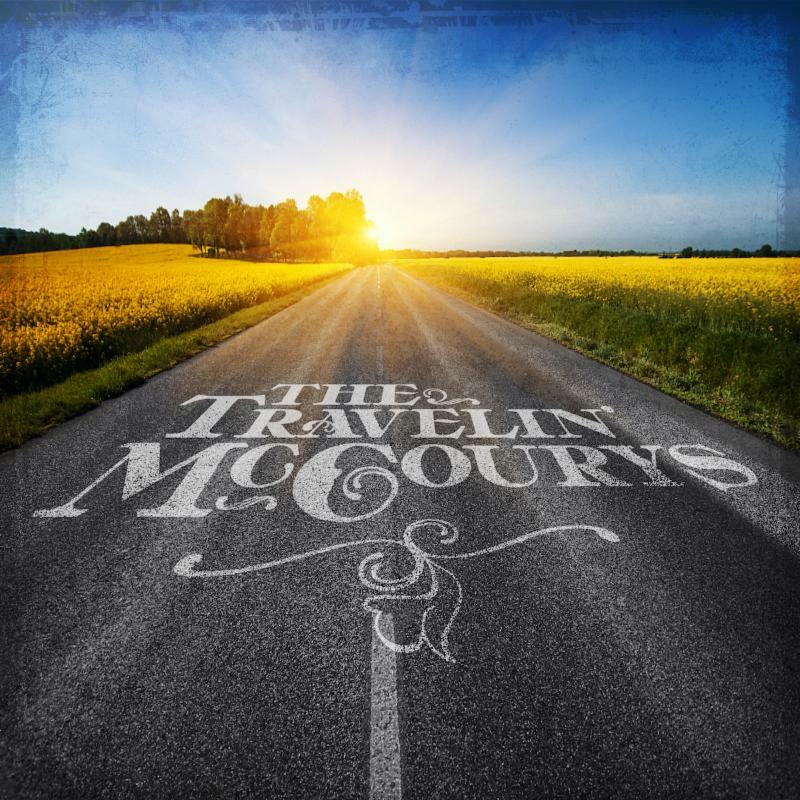 The award for the 2019 Best Bluegrass Album goes to The Travelin’ McCoury’s for their self-titled album. Checkout the DelFest 2019 lineup! NASHVILLE, Tenn. -- Dec. 7, 2018 -- Congratulations to The Travelin’ McCourys on their GRAMMY nomination for “Best Bluegrass Album,” which was announced today on https://www.grammy.com/. The band’s eponymous debut album was released on May 25th of this year after decades of playing-- the GRAMMY nod pointing to both the band’s work ethic and their innovative style of bluegrass, which honors the genre’s tradition and drives it forward. The McCoury brothers-- Ronnie (mandolin) and Rob (banjo) -- were born into the bluegrass tradition. Talk about a source abundant and pure: their father, Del, is among the most influential and successful musicians in the history of the genre. Years on the road with Dad in the Del McCoury Band honed their knife-edge chops, and encouraged the duo to imagine how traditional bluegrass could cut innovative pathways into 21st century music. With fiddler Jason Carter, bassist Alan Bartram, and latest recruit Cody Kilby on guitar, they assembled a group that could take what they had in their DNA, take what traditions they learned and heard, and push the music forward. In fact, the band became the only group to have each of its members recognized with an International Bluegrass Music Association Award for their instrument at least once. There were peers, too, that could see bluegrass as both historic and progressive. Rock and Roll Hall of Fame inductees, The Allman Brothers Band, improv-rock kings Phish, and jamband contemporary Keller Williams were just a few that formed a mutual admiration society with the ensemble. Ronnie, Rob, Jason, and Alan are past GRAMMY nominees and winners with The Del McCoury Band-- this is the first nomination for The Travelin' McCourys as a whole. Listen to the GRAMMY nominated album here. For more information on The Travelin’ McCourys, please visit their website. Relix wrote an article on The Travelin’ McCourys and The Del McCoury Band! Click here to check out this press release from The Press House! "The Travelin' McCoury's are Headin' West! They are stopping off in Colorado for four dates, jumping to the northwest and winding their way down to California before heading home. This tour jump starts the ROAD to DELFEST which leads up to the annual Memorial weekend Festival which celebrates Del McCoury." This fall and winter, music fans will have a chance to experience numerous incarnations of the music of Del McCoury and family, the renowned and revered bluegrass master, as he launches his most extensive tour in more than 15 years. The 35-date run will feature a different configuration of the McCoury family each night and includes dates billed as The Del McCoury Band and Del and Dawg, plus shows by The Travelin’ McCourys, which includes sons Ronnie and Rob McCoury. For a string of dates starting on November 26and running until December 9, fans will be treated to "Del: Get On The Bus" shows featuring Del in intimate rock clubs across the West Coast and Colorado. Tickets for those shows are on sale now. A full list of dates can be found below. Del McCoury’s quest for new sounds is what drives him to seek out and showcase up-and-coming musicians, especially at DelFest. Over the years, Del has helped give start to young bands including Old Crow Medicine Show and Trampled by Turtles while collaborating and touring with musicians ranging from David Grisman (on the Del and Dawg tour), Sam Bush, The Preservation Hall Jazz Band and Steve Earle. McCoury has also expanded his repertoire through working with the award-winning members of his band who also tour for their own loyal fan base as The Travelin’ McCourys. Fans can catch The Travelin’ McCourys on select dates this October on The Grateful Ball tour, dates paying allegiance to the music of The Grateful Dead and feature one of their most recent collaborations with The Jeff Austin Band. As fans know, McCoury’s friends and collaborators range from country music hall of famerVince Gill to rock influencer Dan Auerbach to jam band heavies Trey Anastasio and Jon Fishman of Phish, as well as country star Dierks Bentley, and the late Jerry Garcia. But you don’t need to dig deep into history to find McCoury’s legions of fans that continue to grow as he reinvents his music never veering too far from the classic style he developed while playing with Bill Monroe. McCoury’s versatility was well showcased at the most recent DelFest which featured musicians including Fishman, The Trey Anastasio Band, Gov’t Mule, Bela Fleck and Chris Thile, Marty Stuart & His Fabulous Superlatives, and many others. Don't miss this chance to see Del McCoury and the The Travelin’ McCourys at venues near you. "It was five musicians atop their craft advancing in banter and harmonious bluegrass memories while chiding one another between songs like a vaudeville act." "On October 26, The Grateful Ball featuring The Travelin' McCourys and Jeff Austin Band made its way to The Hamilton Live in Washington, DC... "
"The Travelin’ McCourys have announced more shows as part of their upcoming Fall Tour and a two-night stand surrounding New Year’s Eve. The group also revealed their first ever officially released studio recording." "The best set of the festival came courtesy of The Travelin' McCourys"
"And let us not forget Rob McCoury’s monster solo on banjo or Cody Kilby’s unequalled guitar skills throughout the song. A stroll with the Grateful Dead followed in the form of a mellow and masterful “Candyman”. Some Grateful Grass with the McCourys, eh Keller? Maybe that’s the next lineup? Maybe? Would that it could be so. How marvelous would that be? An entire show of Dead songs thrown down by Keller and the McCourys?? Magnificence! “Something Else” came on the heels of “Candyman” and was followed by Mike Doughty’s “American Car” — both of which sounded stupendous. As you might expect. Keller was in great voice all night, too…made for a near perfect-sounding concert. It was Alan Bartram’s turn up at the microphone next for “Messed Up Just Right” one of my very favorite songs from the Pick album. " But sometimes the chips off the old block will fall where they may, due to circumstances beyond their immediate control. "Actually, this has been going on for about five years now," notes Ronnie McCoury, one of the chips off that solid, silvery McCoury oak known as Del, towering in the bluegrass forest of legend alongside the likes of Bill Monroe, Lester Flatt and Earl Scruggs. Ronnie is referring to a group known as The Travelin' McCourys, billed as "80 percent of the Del McCoury Band," since four out of five people in it — Ronnie, kid bro' Rob, fiddler Jason Carter and bass player Alan Bartram— hail from same. When these fellow bluegrass travelers take to the stage of the Castle Theatre Friday night, they'll be following three prior Castle shows involving both McCoury configurations: Del's band in 2011 and 2012; Del's boys' band in 2014 and, now, this weekend. So which McCoury band is which, musically speaking? "We like to go in and play traditional bluegrass music the way we do with Dad, but we also like to be able to step into situations where we can really stretch out," says big bro' Ronnie, who joined papa Del's band in 1981, at age 14. "If we need to plug in, we'll plug in. We're open to anything." We interrupt this plug for the Travelin' McCourys to reassure fans of papa Del that the old man's band is alive and well and kicking, with the 9th all-star edition of DelFest, his namesake Memorial Day weekend music fest, now ranked as one of the country's top roots music destinations, set for 2016 in Maryland. "What happened," explains his good son, "is that Dad started looking at his age, which was around 72 at the time (he'll turn 77 in February). His mother lived until her mid-80s, but his dad passed at 72." With that specter of mortality suddenly looming, "he started thinking about things and he thought maybe it would be a good time for us to get out of the nest and try to have our own band." Fast-forward five years ... to now. Of course, you can't keep a good musician down ... seventysomething or no. And Del has kept the original band, sons included, going strong, though scaled back to about 50 dates a year, or an average of one a week. "Dad is not one to sit still or retire, and that's the way it's gone ... he's still got an incredible voice and his musicianship is still great," notes Ronnie, 48. "What's astonishing is that, because when we've been gone (with the Travelin' McCourys), he's been given the freedom to do all these collaborations, like the duet he did with Sam Bush two years ago." So much for Dad's retreat. As for the Travelin' McCourys, they've kept logging miles begun half a decade ago. Fresh off a Grand Ole Opry show just several nights before his GO! interview, Ronnie says the group has just entered a new phase with the addition this past fall of flat-picking prodigy Cody Kilby, who was off and running in his teens, straight into a 14-year run with Ricky Skaggs & Kentucky Thunder. He's also a highly sought-after studio player, most recently on Beck's Grammy-winning critical/popular success, "Morning Phase." Prior to Kilby's joining, they'd kept the guitar slot vacated by Del open on a kind of revolving door basis, extending invitations to an array of ace friends and fans like Jeff White, Ronnie Bowman, String Cheese Incident's Billy Nershi, Alison Krauss Band's Dan Tyminski and Infamous Stringdusters' Andy Falco. "We've enjoyed playing with so many guitar players we know," Ronnie says, but, he adds, the stability that has come with a permanent flat-picker of Kilby's prowess has upped their ante. That began at last year's DelFest, where the pact was sealed. "I guess we had our 'a-ha!' moment there .... we were on stage and it was like a light bulb went on," Ronnie says. "With Cody, we really have the perfect combination: a great player, and he fits perfectly with what we do — straddling the fence between traditional and progressive. No matter what we throw at him, he can handle it." Meanwhile, the brothers McCoury play on, and on ... on either side of the McCoury fence, with no end in sight. "I've been in a band pretty much all my life," says Ronnie, "and I'll be coming on 35 years since I joined Dad's band. But neither of us was ever pushed or pressured by him to become musicians." Ronnie was born March 16, 1967, in York County, Pa., where he lived until he was 24, then relocated with his wife Allison to Nashville, which is home to this day. The McCoury boys were weaned on bluegrass, courtesy the many pickin’ parties held at the house, along with rehearsals that Del would have with his band of the era, the Dixie Pals. Around age 13, after attending a show with his Dad where he saw Bill Monroe perform, Ronnie decided that, OK, yes, he wanted to be a chip off the old block and play some serious bluegrass mandolin (he'd taken violin lessons as a kid, but didn't keep at it). Ronnie practiced on his mandolin for six months, soon followed by Del asking his son to fill it a recently vacated mandolin slot in his band. That was on May 28, 1981; the slot has remained filled since. Ronnie McCoury is more than happy to continue in that long-term role, but he's also happy to be a Travelin' man, too. In Del's band, "Dad is always the front guy, it's his show, and it's him who keeps the crowd in the palm of his hand all the time," says Ronnie. Sans Del, "it's something me and the other guys have had to learn how to do, even though we've been play his shows for so long. It's fun for us to figure out a bunch of stuff ... the ways we can stretch out on our own." Rob McCoury, banjo: Full name actually Robin (not Robert); four years Ronnie's junior; joined papa Del's band in 1987, six years after Ronnie; played bass for a year before switching to the banjo he picks to this day. Cody Kilby, guitar: Bona fide bluegrass prodigy, winning awards as teen; member of Grand Ole Opry at 16; spent 14 years Ricky Skaggs' ace flatpicker with Kentucky Thunder; started travelin' with the McCourys last fall. Jason Carter, fiddler: Picked up the fiddle and never put it down one day after hearing Del at age 16; in 1992, asked Del for a job, auditioned, has been there ever since; now with Travelin McCourys, too. 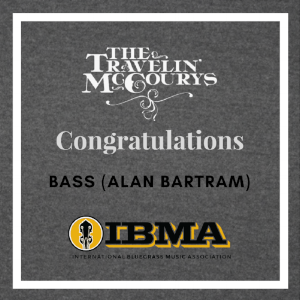 Alan Bartram, bass: Began music career with The Kenny & Amanda Smith Band; joined Del's band in 2005; followed Ronnie, Rob and Jason to Travelin McCourys in 2011.